I watched the two distant, tiny spheres, veiled by skittering clouds, sliding towards one another. I was squatting on my front stoop in the cool early morning, silent, gazing up at the two discs in the sky. 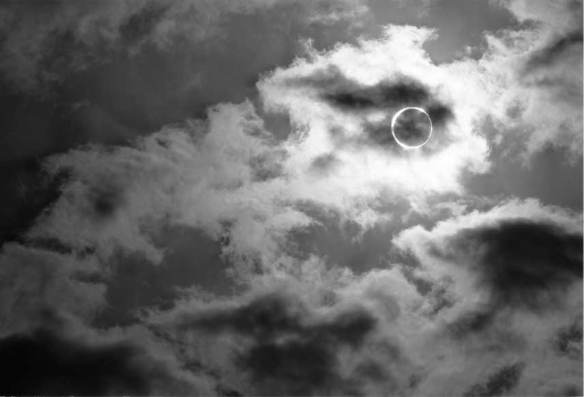 They were like faraway coins, an opaque grey-white moon and a shining, blazing white sun. And they were getting very close now, like lovers after a very long time―slow, measured, and inevitable. I knew how lucky I was. The translucent lace of low clouds served as a shield for my astounded eyes, allowing them to stare unharmed directly at the show. Blessed eyes! They grew wider and softer as they saw the two orbs kiss. Then the darkening moon slid in front of the sun, and the sun passed in back. Moon inside Sun, Sun embracing Moon, changing his shape for her. Soon he would surround her completely in a thin ring of white fire. Little me, spellbound, now standing and staring. And then the clouds went thick, and covered it all. I watched the heavy blue-grey cloud-blanket stick stubbornly between me and my miracle, and I waited. And then, easy as breath, the thick clouds thinned and broke and lifted away in a ripple, and there it was. The sight of it pushed the air into my lungs in a deep gasp, where it stayed. I did not breathe, I did not move. For an eternal moment, I disappeared. I was eclipsed.